TBF DREAM TEAM RALLY – GETTING BACK TO OUR ROOTS IN A BIG WAY! Ponca City, Okla. (Feb 1, 2012) — The Bass Federation announced today the formation of an entirely new, groundbreaking, TEAM tournament trail covering all of North America, TBF’s Dream Team Tournament Rallies. Dream Team Rallies are all about giving anglers what they want, fun and fishing, and they all culminate at the 2013 TBF Dream Team National Championship Rally! TBF Dream Team Rallies are designed to fill a void not only in the federation, but also the fishing industry to give anglers exactly what they’ve been craving. Fun events close to home without lots of hassle, paperwork or overhead, all of your choosing; fish with who you want, when you want, where you want. Rally events will boast integrity and reasonable entry fees to win BIG prizes. Events backed by the power of the federation and a large national prize pool with a real chance to advance directly to big time “dream” vacation events with big time “dream” payouts! 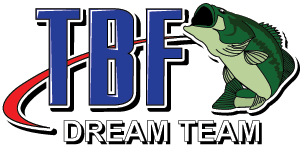 A TBF Dream Team Rally is designed for the grassroots anglers, state federations and clubs of any kind; regular adult clubs, Tuesday night jack potters, over 55 clubs, Guys/Gals clubs, and college clubs, you name it. As long as one team member is over 18 and both are TBF members or joins TBF at registration, the team is eligible. No one is allowed to compete alone, two person teams only. Any TBF State Federation or TBF club can sign up online at bassfederation.com starting Monday, Feb. 13, to host their own TBF Dream Team Rally event anytime in 2012. Host and fish as many as you wish. Your tournament official and event participants will register with TBF online at bassfederation.com. Both TBF and your club will promote the event. TBF will sanction the event; provide insurance, handle all registrations, entry fees, paperwork, and issue prize checks and trophies for distribution at YOUR event! TBF will randomly draw events each month and assign polygraph tests unannounced at local events. There is one set of TBF Dream Team Rally rules, a standard prize structure and advancement formula governing all sanctioned events. Everything is built and based on blocks of 25 teams. You must have 25 teams at your event to advance a team to the TBF Dream Team National Championship Rally; one (1) team advances for every 25th team registered. Three places are paid at the ramp for each 25 teams entered and each event has two big fish awards. TBF Dream Team Rally entry fees nationwide are only $200 per team for active TBF members. Anglers who aren’t active members will join online at the time of registration. Qualified winning teams advance WITH travel, boat gas, and hotel stipends, plus their prize checks, directly to the 2013 TBF Dream Team National Championship Rally where the payout and prizes are BIG and DEEP into the field. That’s right, in addition to their prize check every advancing team is eligible for stipends to help cover their travel, boat gas and hotel to anywhere in the US the TBF Dream Team National Championship Rally is held! A “paid” fishing vacation to America’s top bass lakes! Everyone pays the same amount to the pot, TBF handles all of the back-end details and overhead. YOUR state or club not only gets to define the type of team event but also will earn a $5 stipend from each entry fee to help raise funds for your group. If the team from YOUR event advances to the Dream Team National Championship Rally and wins, your club wins a $1,000 bonus! So, get your event scheduled. YOU choose the date, pick the lake, pick your partners and start fishing! TBF’s Dream Team National Championship Rally will rotate to and from the very best smallmouth and largemouth fisheries in the nation. Popular places you’ve always wanted to fish; lakes a 10lb largemouth, 5lb smallmouth or 5lb spotted bass are a real possibility. The TBF National DREAM TEAM will take home a DREAM RIG! A fully-rigged Ranger Boat, with Evinrude outboard and Lowrance HDS electronics! There will be “Dream” prizes awarded at the Championship Rally such as Cabela’s shopping sprees, Lowrance HDS 10’s with Structure Scans, and of course CASH and much more! TBF’s Dream Team Rally is an extensive program with much more to offer; mostly it’s about fishing and fun. For full details go to bassfederation.com, and click the Dream Team link.